The Apurímac region of South-Central Peru takes its name from the Quechua language and means where the gods speak. The locals say that is because the mountains in the area seem to be talking to each other. The region is one of Peru’s most disadvantaged provinces due to pervasive poverty and low literacy rates. Despite these concerns, the One True God is speaking, working through people like Elena to bring His Word to the people in their heart language, Quechua East Apurímac. Since I don’t have much schooling, I couldn’t grow much as a person. I was afraid to speak up because I thought I might make a mistake. But since I got a Proclaimer, my life has changed, because now I can help anyone listen to the Word of God. Then, after they have listened, I’m not afraid to talk to them about the Gospel, explaining the message more clearly. I’m not afraid of making a mistake because if someone asks me a question I just say that we should listen to the Audio Bible again, and Jesus through His Word will answer our questions. Now, when I visit the people in my community and in other communities, I ask someone to listen to the Audio Bible, and right away many people gather around to listen, too. Several churches have been planted in the Apurímac region and a training program for pastors is scheduled to begin soon. 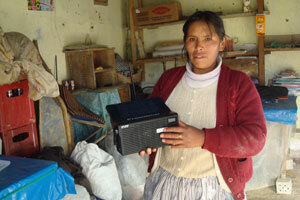 Hearing the Word of God in Quechua assures the people that He loves them enough to speak their language. Using individuals like Elena, God is speaking and lives are being transformed in the mountains of Peru. There are many opportunities for you or your church to partner with Faith Comes By Hearing to bring God’s Word to those who are waiting to hear. Explore the website, pray for the ministry, donate, or call (800) 545-6552 for more information. We are thankful for church partners like Henderson Hills Baptist Church (Edmond, OK), New Hope United Methodist Church (De Pere, WI), Waypoint Church (Vaughn, WA), East Suburban Community Church (Irwin, PA), Grace Covenant Church (Austin, TX), and many others for partnering with Faith Comes By Hearing to provide God’s Word in audio, which is changing lives and creating a lasting legacy for the Kingdom of God. Image: Elena with her treasured Proclaimer.